Many people change their hair color as quickly as they change their minds. From red to black and then to blond, it happens all the time. But how can you go from dark hair to dirty blond? With a few simple steps and a lot of deep conditioning, it can be done. Drape something such as an old towel or hairstylist drape over your shoulders to protect skin and clothes from the chemicals and put your gloves on. Mix the lightening product and developer together to form a consistency similar to hair color. Mix the two products in a color applicator bowl using a color applicator brush to stir. The developer is a product that activates the color product (it is sometimes called an activator instead of a developer for this reason). You can find the color applicator bowl and brush at your local beauty supply store. Apply the mixture to hair, applying it from half an inch off the roots all the way to the ends. After it is all applied, go back and apply the rest of the mixture onto the roots. The roots have typically never been colored and take to lightening faster, which is why you want to put the lightener on that area last. Rinse hair once it has reached a pale yellow stage. This can vary from 10 minutes to an hour depending on your hair. After hair has been rinsed and washed, towel dry until it's about 75 percent dry. Once hair is barely damp you can apply the toner. Mix the toner with the developer in an applicator bottle according to the directions. An applicator bottle also can be found at a beauty supply store. 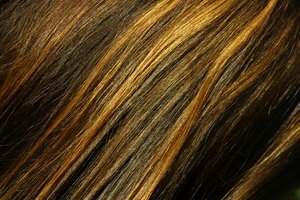 When lightening hair from a dark color you will typically find a lot of yellow and orange tones. An ash-based toner will help to neutralize those tones, leaving you with a dirty blond color. Apply the toner all over your hair, thoroughly saturating every strand, and allow toner to process for the recommended time (about 20 minutes) before you rinse and wash. Apply a deep conditioner to clean hair and keep on hair for about 10 to 20 minutes. A reconstructive deep conditioner is suggested for chemically treated hair. 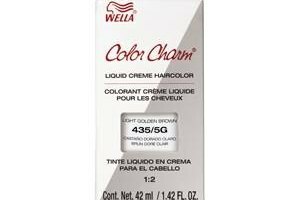 Doing two chemical processes is hard on hair, which is why a deep conditioner is essential to use when dying dark hair to dirty blond or any other lighter shade. Speed up the lightening process by applying heat to your hair. Be sure to wear a plastic bag over your hair before applying heat so that the hot air does not dry out the lightening product. Do not attempt to lighten more than once. If the first time did not work, you may need assistance from a professional colorist.